Former Wiess College Senator Hannah Todd was appointed interim external vice president of the Student Association by an SA Senate vote March 30. Jake Hassell will be this year’s senior class commencement speaker following his selection from a field of 24 candidates, according to former Student Association President Jazz Silva. A memorial service will be held in Houston on Saturday for Jean-Claude DeBremaecker, an outspoken professor of geophysics at Rice for 30 years who passed away Feb. 11. Students at Sid Richardson College will not be allowed to hold private parties for the rest of the semester as a consequence of the unregistered Lads in Plaid party at Sid on Jan. 22, according to the Sid college government. Sid student leaders and university administration characterized the new college policy as a joint agreement resulting from discussion rather than as purely administrative sanctions. A special election will be held for Student Association external vice president by the end of the month, pending SA Senate approval, due to elected candidate Justin Onwenu’s decision to step down before changeover for personal reasons. The University of Houston hosted a heated debate between five contenders for the Republican Party presidential nomination on Feb. 24. UH administrators argued that the debate helped the university gain national recognition, though some students and the student newspaper expressed concerns regarding the event’s impact on students. Griffin Thomas will assume the position of Student Association president after winning a close election against Joan Liu, while Justin Onwenu emerged as the clear winner in a three-way race for SA external vice president. Sheryl WuDunn, a Pulitzer Prize-winning journalist and executive, will give Rice University’s commencement address at graduation on May 14, according to the office of Rice president David Leebron. Rice Program Council external vice president Jodie Nghiem and co-chair of RPC’s socials committee Iman Khan are running for the position of next year’s RPC president. Both Texas A&M University and the University of Texas are considering plans to create new facilities in Houston, according to public statements by A&M President Michael Young and UT Chancellor William McRaven. Rice University’s Critical Thinking in Sexuality Task Force launched a new website, Facebook page and video series this week as part of their effort to garner support and student input for a new mandatory course educating incoming students about healthy sexuality. A Rice University student was sexually assaulted early Saturday morning at an unregistered party, themed “Lads in Plaid,” on the seventh floor of Sid Richardson College, according to the Rice University Police Department. 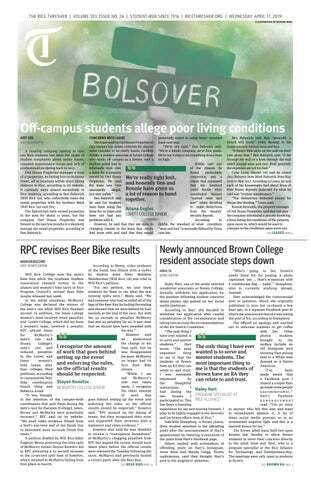 After an investigation in which RUPD sent several crime alerts to the Rice community, RUPD identified a male Rice student as the suspected perpetrator. The Faculty Senate Task Force on the Honor System will hold student focus groups this week as part of its ongoing effort to evaluate and recommend changes for the implementation of Rice University’s Honor Code. Rice University will continue to prohibit all weapons on campus, opting out of a new state law allowing handgun concealed carry on college campuses, President David Leebron announced Monday. The Student Association Senate passed Senate Bill #4, creating a task force charged with developing a mandatory Critical Thinking in Sexuality course for new students, by a 19-7 margin at the Nov. 11 Senate meeting. The Houston Equal Rights Ordinance, a proposition to guarantee various anti-discrimination protections, was voted down by a significant majority in the Nov. 3 election. In the mayoral election, out of a field of 13 candidates, Sylvester Turner and Bill King gained enough votes to advance to a runoff election to be held Dec. 12. Rice University placed 1,271st out of 1,275 American four-year colleges under a new ranking created by The Economist, a major weekly newspaper. Student Association President Jazz Silva officially introduced a bill creating a task force to spearhead the design of a mandatory Critical Thinking in Sexuality course for incoming freshmen at the Oct. 28 Senate meeting. Since her presentation, an amendment to mandate a second round of SA voting has been added to the bill. The vote, which was originally scheduled to Nov. 4, will now take place on Nov. 11. Students across campus continue to express concerns to their representatives before they vote on the bill. The Houston Equal Rights Ordinance (HERO), a controversial law guaranteeing various anti-discrimination protections, was voted down by a significant majority in the Nov. 3 election.